The emission of sulfur oxides can have harmful effects on the environment. Biodesulfurization of fossil fuels is attracting more and more attention because such a bioprocess is environmentally friendly. Some bacteria, like Rhodococcus, have been used or studied to upgrading the fossil fuels on sulfur content limitation with their gentle desulfurization and high desulfurizing competence, without lowering the calorific value of the fuel. Recent advances have demonstrated the desulfurization pathway called “4S” pathway, including four enzymes, and the molecular mechanism for biodesulfurization has also been described. In addition, genetic manipulations, such as co-expression of flavin reductases, promoter modification, increasing the expression of key enzymes, expressing of desulfurization enzymes in heterologous hosts, and rearranging the dsz gene cluster were also used to improve sulfur removal efficiencies. 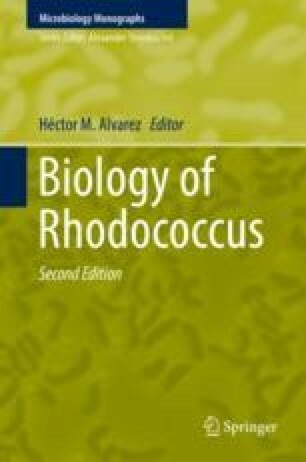 In this chapter, we summarize the mechanism of biodesulfurization in Rhodococcus. We gratefully acknowledge the support for our research from the Natural Science Foundation of Tianjin, China (grant numbers 05YFJMJC00700, 09JCZDJC03200). We also thank the publisher of the American Society of Microbiology and the American Society for Biochemistry and Molecular Biology to offer kindly help with useful pictures.